In the course of the discussion between Mr. Ciopraga, Secretary General of the PS IGC TRACECA, and Mr. Zhu Xiangyang, President of “Lianyungang Port Group” company, it was noted that in the region of TRACECA there are large trade markets. Investment cooperation has a big potential. It is reasonable to consider an adequate trade scheme aimed at elimination of barriers and reduction of costs. The port of Lianyungang has advantageous geographic location – it is connected by railway with big Chinese cities and has maritime connection with the Korean port of Pusan and Japanese port of Osaka. 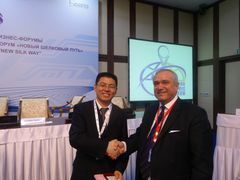 The involvement of China, as well as of Korea and Japan through Kazakhstan as the MLA TRACECA member state in the transport logistic chain of the whole corridor will make it possible to expand the development area of the region Europe-the Caucasus-Asia and to improve transport communication. The Parties also noted that by the end of 2015 the volume of export and transit traffic via the Kazakhstan logistic terminal will achieve 250 thousand TEU (Twenty-Foot equivalent unit). In five years it is planned to double this figure. The cost of the project is USD 99,3 million.